What that means to you: With almost two-thirds of all customers using the internet to research a product or service prior to buying (and this includes YOUR customers) - you NE ED to have a web presence. One that can be found while using keywords that are relevant to your product or service. You need to implement an SEO program consisting of onsite and offisite tactics. One that will raise pages of your site to the first page of Google. Your website needs to capture leads (not just a contact page). Your website has to talk to your audience in their language, using words that speak of their pain and their problems. I can go on, but the point is you need to have more than just a ‘brochure’ website. Your site must be relevant for your customers and contain fresh content for your customer AND Google. 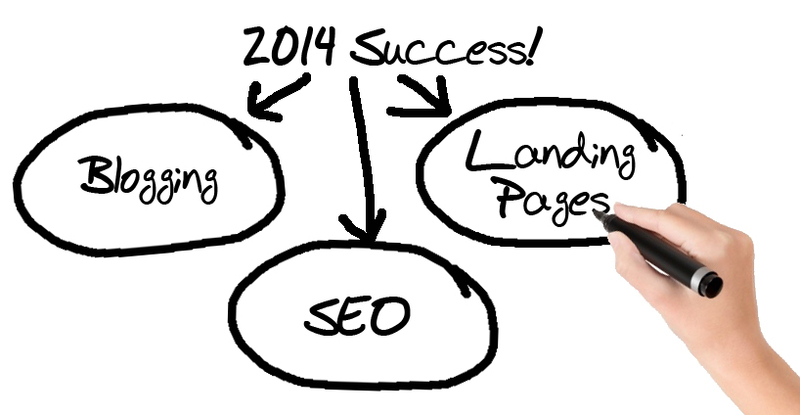 What this means to you: Your SEO program has to be good enough to get you to the first page of Google. Not just your ‘branded keywords’ (keywords that use your company name). But with long tail keywords (keyword phrases that consist of 3 or more words) will help you be found by your audience and will produce better leads than short ‘more general’ keywords. Make search engine optimization a part of your marketing efforts. A website that isn’t found on page one under any relevant keywords is a site that won’t generate many leads. What this means to you: You need to implement a Blog on your website! I know, who has time to blog? But take it from someone who said the same thing. But I've seen the light. A blog HAS to be part of your marketing efforts for 2014. Outbound marketing has become less effective as customer choices for receiving their information has become fragmented. Their options for blocking advertising messages have become more effective. Outbound marketing is also seen as intrusive and unwanted. Inbound on the other hand (which blogging is a part of) is available for customers to find while researching. Is relevant to their situation. Is useful info concerning their needs AND most importantly, influences their decisions. A good inbound marketing effort will position your company as the expert in that customer’s need category. In short - Inbound marketing is a required method of doing business in today’s more consumer-focused world. And, Inbound is often more cost efficient than old-school, outbound marketing. Sounds good, right? ...Less money, more customers. Companies with 30 or more landing pages generate 7x more leads than those with fewer than 10. (HubSpot). What this means to you: Landing pages are a page on your website with a CALL TO ACTION that allows a visitor to download information in exchange for their name and email address. Your website should be updated with paths to these landing pages. Once a visitor has ‘raised their hand,’ you now have to opportunity to market to them with relevant AND automated emails. Your site should have multiple paths to these landing pages. Your landing pages should compliment your customer needs with your services. What this means to you: Staying connected to an interested lead will better your chances of converting that lead into a customer. Once an interested customer has ‘raised their hand’ and contacted your company for more information, you need to stay in touch with them. How to do this economically? Through an automated process of emails set to deliver on specific dates and times past the initial contact. Research reveals that it takes 7 to 13 touches to turn that initial contact into a customer. What this means to you: While others ‘may’ be gathering leads, the majority of them aren’t nurturing them. Which leaves a lot of room for an organized company like yours to take the lead (pun intended) and win those customers with your automated sales process. Get a jump on your competition in 2014. While you may be behind the industry trend, there is STILL plenty of room for your new onlne marketing efforts to have an impact on your 2014. Just because you may be getting started late, doesn’t mean you can’t do a better job than others and outperform the competition! Want to learn how to get started on implementing these inbound marketing tactics? Download our ebooks on getting started with SEO, Blogging and Landing Pages today!